How to watch Pirates of the Caribbean: Dead Men Tell No Tales (2017) on Netflix Costa Rica! Sorry, Pirates of the Caribbean: Dead Men Tell No Tales is not available on Costa Rican Netflix, but you can unlock it right now in Costa Rica and start watching! With a few simple steps you can change your Netflix region to a country like United Kingdom and start watching British Netflix, which includes Pirates of the Caribbean: Dead Men Tell No Tales. We'll keep checking Netflix Costa Rica for Pirates of the Caribbean: Dead Men Tell No Tales, and this page will be updated with any changes. 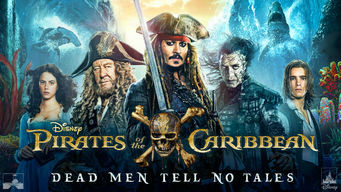 Pirates of the Caribbean: Dead Men Tell No Tales is not available in Costa Rica BUT it can be unlocked and viewed! Captain Jack Sparrow finds himself in hot water when Salazar escapes the Devil's Triangle and makes it his mission to obliterate every pirate at sea. Everyone says he's lost a step. But they ought to know by now -- Captain Jack is a pirate who's always one step ahead. There is a way to watch Pirates of the Caribbean: Dead Men Tell No Tales in Costa Rica, even though it isn't currently available on Netflix locally. What you need is a system that lets you change your Netflix country. With a few simple steps you can be watching Pirates of the Caribbean: Dead Men Tell No Tales and thousands of other titles! Watch "Pirates of the Caribbean: Dead Men Tell No Tales"
Want to learn how to get American Netflix in Costa Rica?